Despite a bad start out of the gate, veteran campaigner Pender Harbour rallied from last place to win the featured $125,000 Steady Growth Stakes, Sunday at Woodbine. Sent postward the 8-5 second choice to the 3-2 favourite Ultimate Destiny in the mile and one-sixteenth stakes event, Pender Harbour dwelt at the start, spotted the field several lengths and appeared to have his hopes sunk for yet another stakes win. But ridden patiently by Luis Contreras, Pender Harbour circled his seven rivals rounding the far turn, then battled with leader Urban Forester almost the entire stretch before prevailing by a hard-fought length in 1:42.39, just 17/100ths of a second off the track record. Ultimate Destiny wound up third, two lengths further back. For trainer Mike DePaulo, it was his 50th career stakes win as he celebrated his 50th birthday. Earlier in the eventful day, the DePaulo-trained Athenian Guard looked like a winner in early stretch before propping and unseating jockey Justin Stein in an allowance contest for Queen’s Plate hopefuls. With the victory, his 10th in 28 career starts, the chestnut six-year-old gelding went over the $1.5 million mark in earnings. 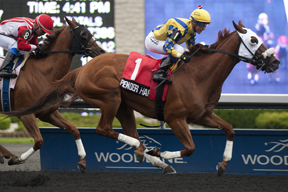 Pender Harbour, plucked for just $15,000 at the 2009 Canadian September Yearling Sale, was voted a Sovereign Award as Canada’s top three-year-old in 2011. He also won the Steady Growth in 2012. Pender Harbour returned $5.30, $3.30 and $2.20, combining with Urban Forester ($5.90, $2.80) for a $33.70 (1-8) exactor. A 1-8-2 (Ultimate Destiny, $2.40) triactor was worth $68.30, while a $1 Superfecta [1-8-2-6 (Bobcaygeon)] paid $165.60.